This book has been in my head for years. I watched so many of the young adults who were in or near my life struggle with OCD and debilitating anxiety. Their courage was both breathtaking and fascinating. I became haunted by the question of what it would be like to be them, to cope and carry on in the world with this invisible burden. 2. So is Adam based on someone you really know? He seems like such a genuine character. Ah, bear with me here. My Adam is a composite of a few young men I’ve had the good luck to know. I stole their gentleness, intelligence and fierce protectiveness, and I gave those pieces to Adam. He became real and whole very fast. That first scene—when he falls in love with Robyn before she even shuts the door—was in my head for years. Yet after I’d finished the first full draft of the novel, I worried that Adam was too good, too sweet, too decent in the face of the enormous weight he had to carry. Then I went to an international conference on OCD in Chicago, and it was there that I met him: a young man about Adam’s age, strikingly attractive, sensitive, smart and funny. I watched him as he posed questions to the experts. This young man vibrated with confusion and pain, not only for himself but also for the people who loved him. In his soft southern accent, he asked expert after expert when he would “hit bottom with all this,” and if he’d recognize it when he got there. He’d deal with it, but he wanted to know how much further down he and his family had to go. I’d found him. This was my Adam. The next day, I noticed him standing alone and I went up to tell him that he had inspired me. I told him that I was writing a book and had been fretting about the “hero” being too amazing. And now, because I had met him, I knew there was no such thing as too amazing. I thanked him, and he—understandably bewildered—thanked me. And then, to my everlasting regret, I ran off before he could say anything else, because like a fool, I was crying. 3. What about Robyn? Is she also based on someone you know? Robyn is probably me. I inserted myself into her reality and took her story where I would likely have taken mine if I were her. I would absolutely have fallen in love with an Adam. 4. I love the way the kids’ alter egos reflect aspects of their personalities. What made you choose superheroes? When I was a kid, I loved, loved, loved comic books! I confess that I still line up for all the superhero movies. While my girlfriends read about Archie, I read their older brothers’ stash of superhero comics and got into heated, never-ending debates about Marvel versus DC. Marvel had the character edge for me overall, but I always loved Batman best. 5. 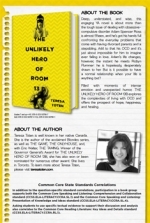 Your portrayal of obsessive-compulsive disorder is so true to life. What kind of research did you do when you were writing the book? It was a long road. I certainly know quite a few young people and adults who have OCD. That was my starting point. Then I read dozens of books, memoirs, self-help guides and research papers. I had the benefit of good advice from generous professionals like Dr. Peggy Richter at the Frederick W. Thompson Anxiety Disorders Centre in Toronto, and as I mentioned, I went to that wonderful international conference in Chicago, where I spent a few days questioning and observing everyone I met, and snuck into as many teen panels and workshops as I could. 6. Was there a particular message you were trying to get across with the novel? No. I honestly wouldn’t know how to do that with any skill. My characters move through their drama while handicapped by a disorder, but the novel’s not about the disorder. All of us have experienced, to varying degrees, moments of debilitating anxiety and depression, and even obsessive thoughts. That is part of being human, and it is certainly a hallmark of being a young adult. 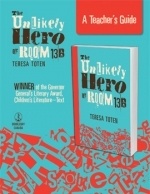 To me, The Unlikely Hero is about first love, making friends and struggling with yourself. If my readers have done any of that, hopefully they’ll feel just a little less alone when they pick up the book. 7. 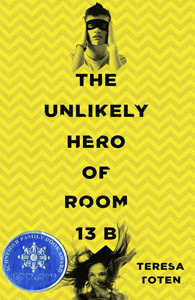 If readers see themselves in Adam or Robyn, or any of the other kids of Room 13B, are there places they can turn for help? There are some excellent resources for both teens and educators on the web, and people can go to those out of interest or need. I’ve posted links to the most helpful sites on my website, teresatoten.com, and we’ve also provided a list of resources in this book. 8. The book tackles some serious issues, but it’s still so funny and heartfelt. Was it hard to strike that balance? 9. I think we’ve all experienced those moments of laughter mixed with despair. Can you tell us some of your favourite books for that? It’s like writing on a knife-edge, trying to pull off the despair/ funny card trick. Even so, dozens of those books line my shelves, and I am a certified fan of so many more. I’d have to say that memoirs seem to play with that balance the best. My favourite is Mary Karr’s The Liar’s Club, followed closely by Catherine Gildiner’s Too Close to the Falls. A couple of exceptionally funny and heartbreaking OCD memoirs are Jennifer Traig’s Devil in the Details and Fletcher Wortmann’s Triggered. In YA literature, the “Sues” (Susan Juby and Susin Nielsen) finesse humour and hurt each time out, as do the amazing John Green and Libba Bray. Stephen Chbosky’s The Perks of Being a Wallflower also holds a special place in my heart. And finally, although he writes for a slightly younger crowd, the wonderful Brian Doyle showed me what to aspire to in just about everything he ever wrote. 10. What are you working on now? Will we ever get to find out what happens to Adam and Robyn? I leave the fate of Adam and Robyn with my readers. I genuinely look forward to hearing what they think will happen to them. My next book is called Slightly Damaged. It’s a psychological thriller about two beautiful, emotionally injured young women who somehow become entangled in a murder. 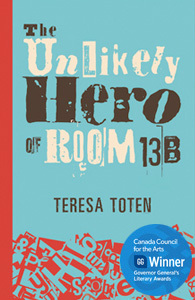 Teachers & librarians – download a discussion guide to accompany The Unlikely Hero of Room 13B.